Easter is round the corner. And, it is spring time! What can be a better combination to lie your hands on some super cool and novel baking ideas? No festivities is complete without a beautiful and tasty cake in place and that is why handpicked these cakes, cupcakes, and even cake pops ideas to ease you searching efforts. Just look at the fabulous treat for the eyes! They are equally good on your taste buds! Dark chocolate cake with crumbled tops and marshmallow tops for carrots! Peanut butter and bananas are good for your healthy. 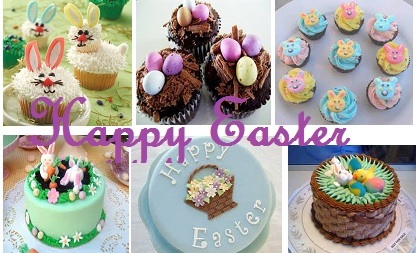 Let us now make them a little unhealthy and whip up a batch of lip smacking cupcakes to sweeten up Easter! 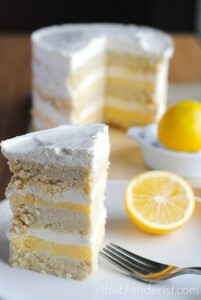 Treat yourself to a fabulous cake this Easter putting your worries about gluten and calories from sugar at rest with this marvelous coconut and lemon layered cake from theblenderist.com. I just love this cake from Betty Crocker. Just see how cute it is – the bunny digging its head into the mud in search of its favorite food – carrots! While Crocker has used her instant mix, you can use your basic chocolate cake recipe for the same. 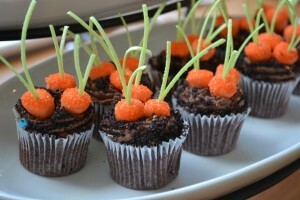 Carrots are indispensible elements of an Easter feast. 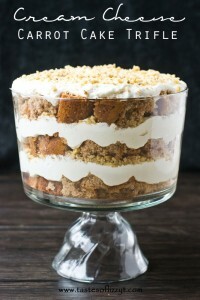 Why not give your traditional carrot cake a miss this time and use this lovely and beautiful carrot cheesecake recipe from the wickedgoodkitchen.com? All you need is oodles and oodles of patience to get the cake right and I know you do have it! So go ahead! 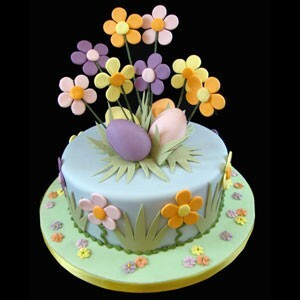 A very simple cake that does not need any special efforts, it is a colorful way to pep up your Easter celebrations. You can use M&Ms in the place of food coloring. They would look gorgeous! What are your thoughts on this one from hisugarplumsblog.com? Beauty, right? I know this does have a recipe. So what you can do it bake a cake of your choice. Going with the theme of the occasion, a carrot cake would be fabulous. Make a delicious butter cream and frost the cake. Use Kit Kat [the Senses edition preferably] to make the basket. 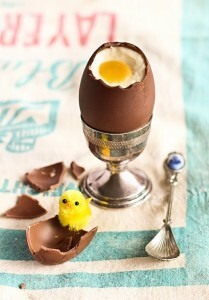 Top it with Nutties or any such ‘chocolate eggs’. 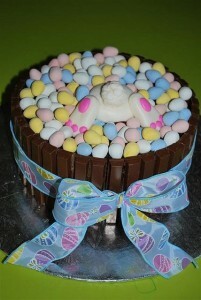 You Easter Eggs Basket Cake is ready. There is no words to describe the beauty of these cakes. Like a egg that cracks to allow chicken to hatch and come out to this world, this chocolate egg has cracked allowing the cheesecake to flow out. It is just nothing but filing my mouth with an ocean of saliva. She gives you so many variations. So pick the one you are comfortable with and go ahead! Ensure that you are shaping your vanilla cake into ‘eggs’ and not ‘balls’. 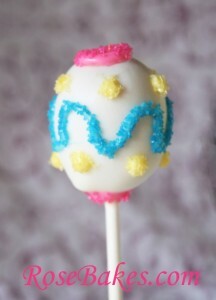 Use M&Ms or even simple chocolate chips to adorn your cake pops. Your kids are sure to ask for a second serving. So go ahead and start baking right away! Tired of baking the same old carrot cake every Easter? 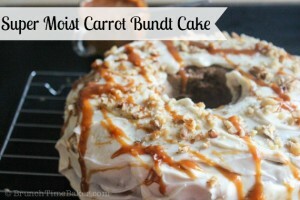 Try this cake from vanillabeanbaker.com. This is your good old carrot cake but with a lip smacking milk chocolate buttercream frosting. The idea is even more tempting. You can place little chick toppers in the place of that birdie or a little hen also. Strawberries are not just for Valentines’ day. 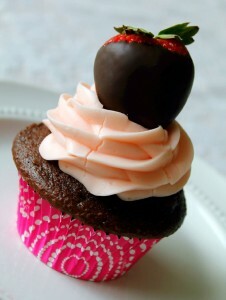 You can give your Easter celebrations a novel touch of sweetness by baking these chocolate covered strawberry cupcakes from foodtasticmom.com. Do not like a cream cheese frosting? Use your favorite butter cream or even a simple whipped cream would also be good enough! I love M&Ms, especially the peanut butter flavored ones. And, that is why I always end up going head over heels when I see an M&M cake. 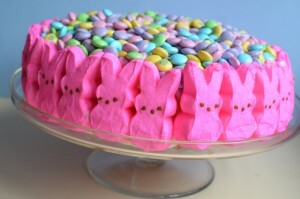 It is quite similar to your Easter basket cake, but the bunnies are adorning the fences. 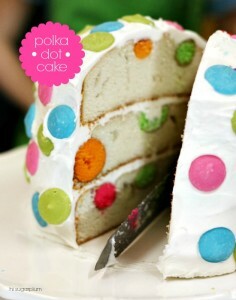 Just that you are using M&Ms inside the cake and atop it to enrich it! Every bit and every moment of Easter celebrations calls for the inclusion of carrot cake. Let us try something new, yet not leaving behind the classic elements of festivities with this fabulous cake trifle. 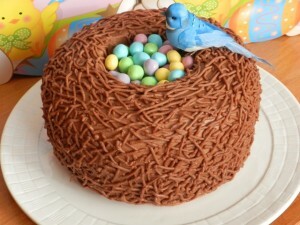 I fell in love with this cake from tendercrumb.blogspot.com at the first sight itself. So pure, yet so elegant! 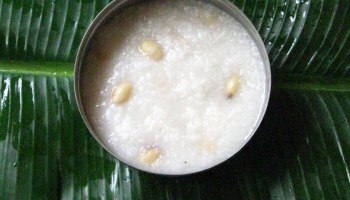 There is no doubt you will find yourself flooded with requests for a second serving. 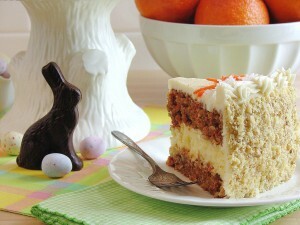 Frosted lavishly with cream cheese, this carrot cake is a good deal to cinch this Easter. You can easily bake it. No worries if you don’t have a bundt pan. Use your spring form pan and go ahead. 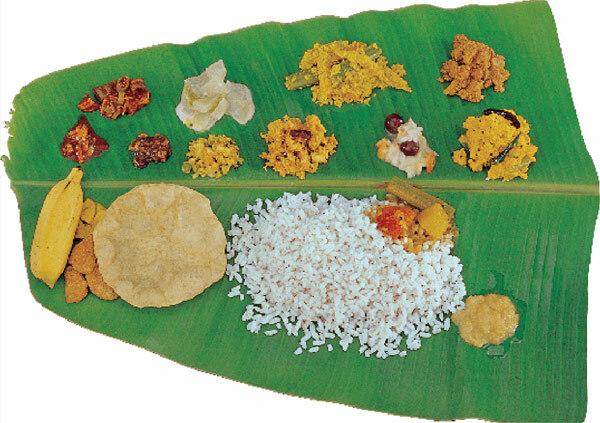 Only the shape varies here and not the richness or flavor. 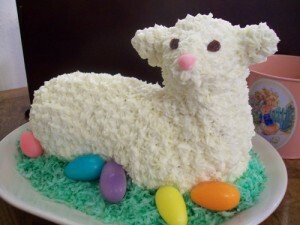 What is Easter without a lamb cake? Try this one from alltheamericantable.com! These cupcakes look so cute and sweet! Wow! All you need is a batch of cupcakes of your choice. 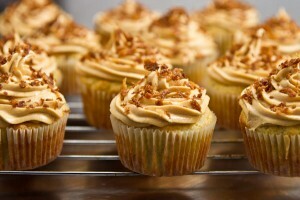 While the author from birdonacake has used yellow cupcakes, my vote goes for carrot cakes or lemon cupcakes. Frost them with a simple yellow food coloring infused butter cream. 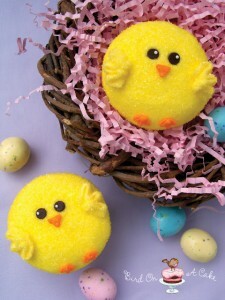 Use dark chocolate chips to give the chicks their eyes and grated carrots for the nose and feet. 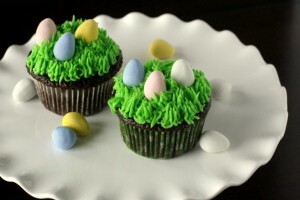 If you love chocolate cupcakes, then this one could be your pick to zest up your Easter this year. Add a couple of green food color into your butter cream icing and use the 233 Wilton tip to get your grass right. Use Easter egg candies as your eggs. Simple, yet elegant! 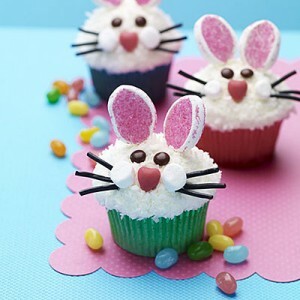 Give your Easter celebrations an added zing with these easy to make Easter bunny cupcakes. 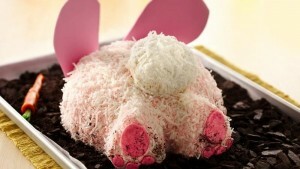 This one from myrecipes.com is an unarguably easy way to put together your Easter bunny. It is Spring. 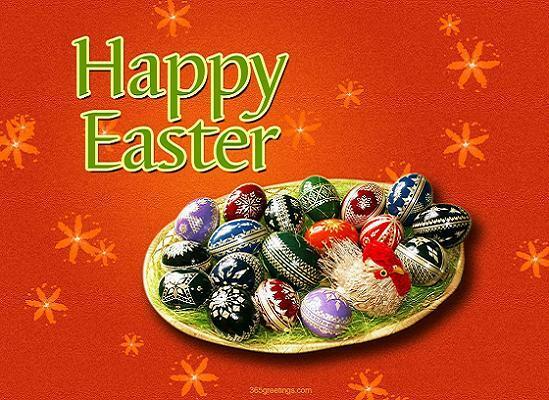 It is Easter. It is time for celebrations. So what are you waiting for? 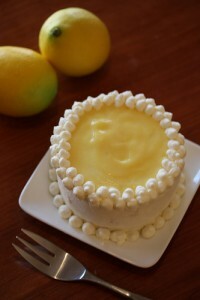 Get into your kitchen and start baking this refreshingly beautiful and exotically tasting cake that looks similar to the one from janeashercakes.com. Use a simple vanilla butter cake as the base. Frost it with a subtle green color hued butter cream frosting. Use just a drop to ensure that the color is very light. You will get the toppers in the market. Use edible flower and grass toppers or even sugar candies. You are sure to win appreciation. 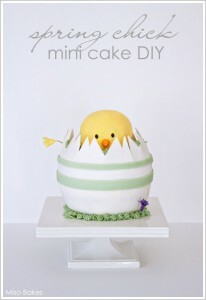 “This little egg cake is actually the size of a small bowling ball”, says Miso who shares her chick cake recipe with us on thecakeblog.com. And, the chick looks really so cute and beautiful. Involve your kids as you decorate the cake and they will be very happy in putting together the chick for you. This one is from bakeralla. And, it is really fabulous! 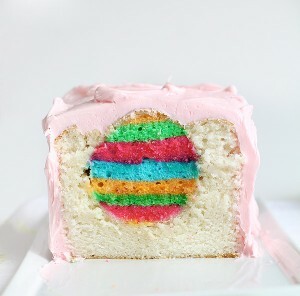 You ought to try this if you are putting together an Easter party for your kids. 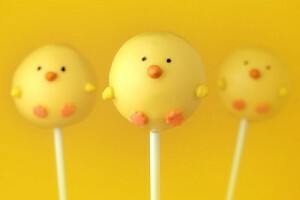 So what is your pick for Easter cakes, cupcakes, and cake pops for this year? Share your views and ideas with us in the comments section!